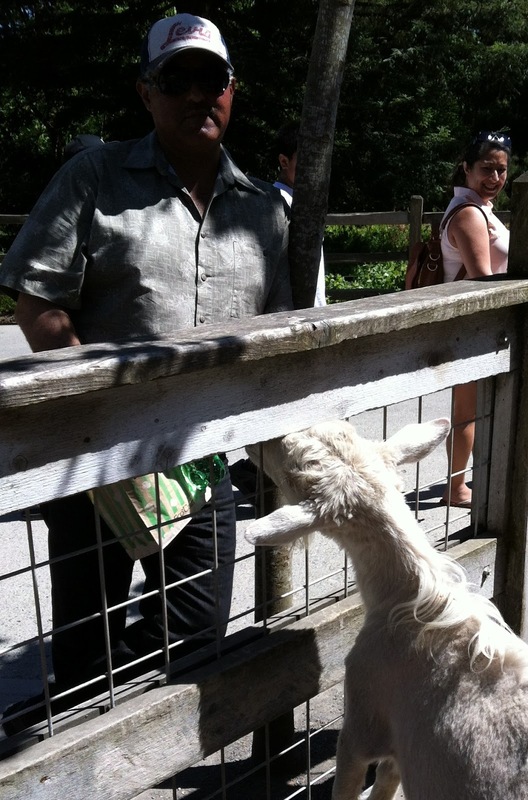 This moron takes delight in subverting a petting zoo. Sunday I took my 8-year-old and his friend to the Portland Zoo. The sun shone and it was a good time, made better by curious dwarf mongoose enjoying their habitat. The kids wanted to pet the goats in the petting area. While they were doing so I noticed a goat riveted to a portion of fence. A man was surreptitiously throwing popcorn into the enclosure, making a goat strain hard to get more. Obviously there were signs posted not to feed the animals. My first impulse was to say, "What the hell, dude? Don't feed the animals!" But the impulse was held in check as the kids could still pet the goat even if it was straining at the fence. Also I didn't really understand what level of transgression tossing a few popcorn kernels into the goat pen amounted to. I try not to be a sanctimonious enforcer of rules solely because they exist. I snapped a picture figuring correctly I would return here for full analysis, and then told the "Zoo Teen," a skinny girl about 15 tending the exhibit, that there was a guy feeding the goats. "I know," she said, letting out a small sign. I wanted her to at least indicate if the guy should be confronted or if she was saving her authority for a transgression of a more substantial nature. Parts of life are forever in the ether, unknowable and lost in interpretation. This was one of them. The kids quickly wanted to see other animals and we moved on under the perfect sunshine. But today when I think about it the thought remains, It's a petting zoo for small kids. What kind of jerk wants to mess with that?